This is page 17 from issue #14, which debuted in 1981. It's pencilled by legendary artist Sal Buscema and features ROM in 3 panels, and even one a Dire Wraith transforming. 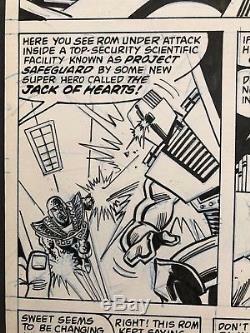 As an added bonus, it also features another Marvel hero, Jack of Hearts, facing Rom in one panel. 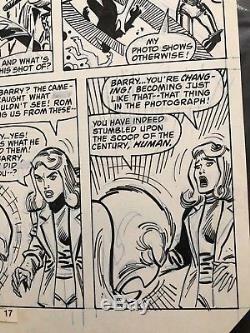 Just a great panel page from a popular series, that is also signed by Sal Buscema in the 1st panel. 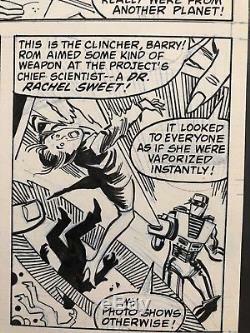 ROM art has a devoted collector's base, and early pages like this don't turn up often. 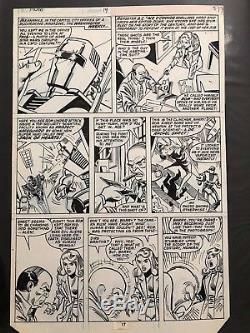 The item "1981 ROM Spaceknight Original Art Issue 14 Page 17 Sal Buscema Marvel Comics" is in sale since Sunday, November 25, 2018. This item is in the category "Collectibles\Comics\Original Comic Art\Interior Pages". The seller is "russ_doha" and is located in Miami, Florida.